Most providers are in the dark about the how to report under MACRA. If new value-based, quality care has you feeling a little dizzy, you’re not alone. Many eligible clinicians aren’t sure if they meet qualifications nor have they received communication from CMS on their status. But whether you’re out of the loop or have followed the transition closely, 2017 reporting is underway — and it’s time to get a handle on MACRA to avoid penalties later. Refresher course: MACRA mandated a multi-leveled Quality Payment Program (QPP) that replaced the Sustainable Growth Rate (SGR) as the go-to payment system for Medicare on Jan. 1, 2017. The two pathways to report under and receive payment through — the Merit-Based Incentive Payment System (MIPS) and Advanced Alternative Payment Models (APMs) — promote value-based, pay-for-performance care, trumping the old quantity-over-quality ideology of the SGR’s fee-for-service system. 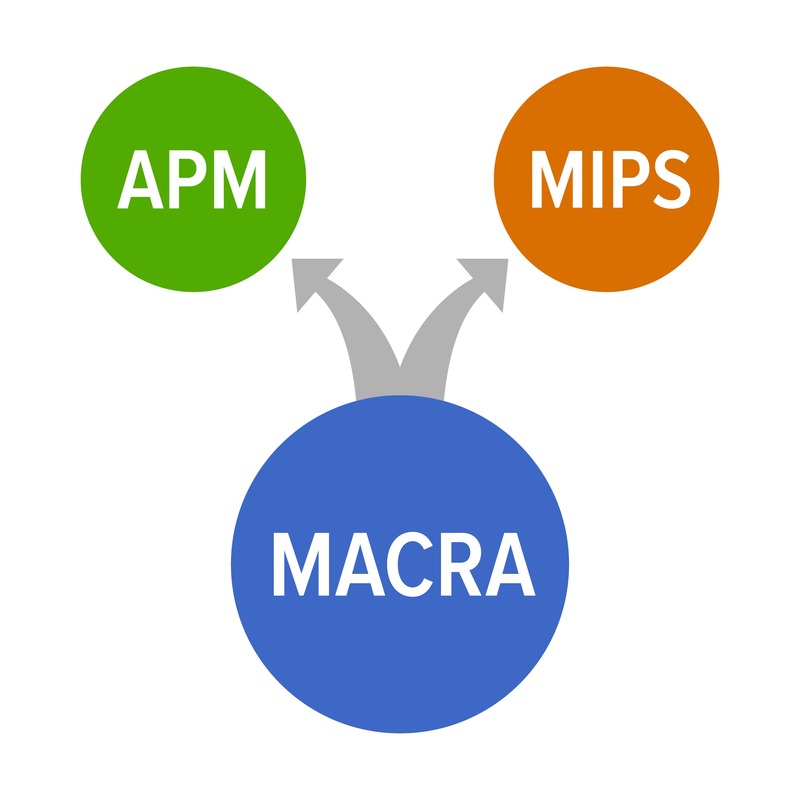 Nuts and bolts: Most providers will report under MIPS, the easier MACRA entryway. This path has four categories — Cost, Quality, Clinical Practice Improvement Activities (CPIA), and Advancing Care Information (ACI) — and four paces for entry and data reporting, which include no participation, minimal participation, partial-year, and full-year. Consider this: This year is kind of like a “get out of jail free card” when it comes to MIPS, says Mike Schmidt, an HIT compliance expert who works for Medflow in Charlotte, N.C., and who recently presented a webinar that briefed ophthalmology practices on the requirements. 3. Meet the four Advancing Care Information base measures. Keep in mind, with each passing year the penalty rises with an estimate of a 9 percent penalty to your payments by 2022. Risk factor: While Advanced APMs are more involved and require more work, the reward for the go-getters can be significant. “If you receive 25 percent of Medicare covered professional services or see 20 percent of your Medicare patients through an Advanced APM in 2017, then you earn a 5 percent Medicare incentive payment in 2019,” notes CMS’s factsheet. And “the size of your payment adjustment will depend both on how much data you submit and your quality results,” the fact sheet says. See the CMS Quality Payment Program factsheet at https://qpp.cms.gov/docs/Quality_Payment_Program_Overview_Fact_Sheet.pdf. Practices won’t have to do very much in 2017 to avoid reimbursement penalties in 2019 under MACRA’s final rule and MIPS, which is a positive. But the bad news is that many providers are either not on board, haven’t been updated by CMS about their eligibility, or have no idea what, where, and how to report their data. Complications: So if you bill Medicare more than $30,000 in payments a year and see more than 100 Medicare patients annually, then you are required to report measures under MACRA. The problem is that many of the providers haven’t been notified of their status by CMS. “It is now three months into the 2017 performance period and CMS has failed to notify clinicians and group practices regarding low volume threshold exemptions, status as hospital-based or non-patient-facing, as well as approved lists of registry vendors,” said the Medical Group Management Association’s (MGMA) Anders M. Gilberg, senior vice president of government affairs in a March 15 letter to Seema Verma, the new CMS administrator. “This is generating considerable frustration and confusion,” he adds. The struggle: About 32.5 percent of Medicare providers will be exempt from the program automatically while 32.5 percent are unaware if they even qualify for MIPS, Gilberg says, referencing CMS’s own data from November. Read the Federal Register ruling at www.federalregister.gov/documents/2016/11/04/2016-25240/medicare-program-merit-based-incentive-payment-system-mips-and-alternative-payment-model-apm. Fiscal Impact: Due to the lack of CMS information, some providers are thinking about forgoing the hassle and gamble of MIPS completely, similar to how some providers opted out of Meaningful Use and PQRS. If you plan to hold out, you should at least run the numbers to see what resistance will do to your revenue. Caution: And remember, as of right now only Medicare is adopting this payment model. But what if private payers adopt similar standards and hold you to them? This is often the case with healthcare regulations, and if they do, the math changes dramatically, experts warn.